Breakfast is the most important meal of the day, or so the old adage goes. So start your day off right with the help of some of the most visually appealing Instagram accounts on the platform. From colorful bagels to latte art, healthy brunches to mesmerizing pancakes, Instagram has no shortage of delectable-looking morning foods. And while gazing at these hunger-inducing images, you'll also get a lesson in marketing. These culinary creators are behind some of the biggest crazes in food. Some have built careers by developing new products that have gone viral, while others have found effective ways to promote their brands and services. The man behind the latest food craze to go viral continues to share his creations for those not lucky enough to be able to pick up one of his artistic bagels in Brooklyn. Some of Scot Rossillo's recent designs include a tribute to the New York Yankees and the upcoming movie Finding Dory. He uses his colorful Instagram account to drive traffic to the store and special orders for any celebration. The Luck Of The Irish • "Because You Cannot Have Creativity Without Passion" Scot Rossillo "Worlds Premier Bagel"
Michael Breach can create just about anything with a latte. Love Game of Thrones? Check. How bout Prince? Check. Maybe Suicide Squad is your thing—he's done that, too. Breach got his start as a late-night Manhattan barista who eventually turned to latte art to cure his boredom. His Instagram account shows how he turned a niche skill into a booming career. Breach also shares his work on Snapchat—add him at baristartnyc—if that's your preferred social platform. You'll never look at brunch the same way once you start following this online producer at Australian recipe website Food to Love. Going only by Katie, this foodie shares bright, eye-catching photos of her daily breakfast concoctions like cinnamon chia oatmeal and a toast combo of avocado, tomato, ricotta and poached eggs on light rye. Breakfast bowls be bringing the goods when you're fluey AF and need some urgent vitamins. Kris, a Bulgarian food blogger who runs Pears 'N Pancakes, shows just how fluffy pancakes can be. These edible pillows will make you run for the nearest griddle, but she's not a one-trick pony—Kris shares delicious oatmeal bowls as well. Pearsnpancakes has garnered over 40,000 followers on Instagram, and each post points fans to a corresponding blog where they can get the recipe. 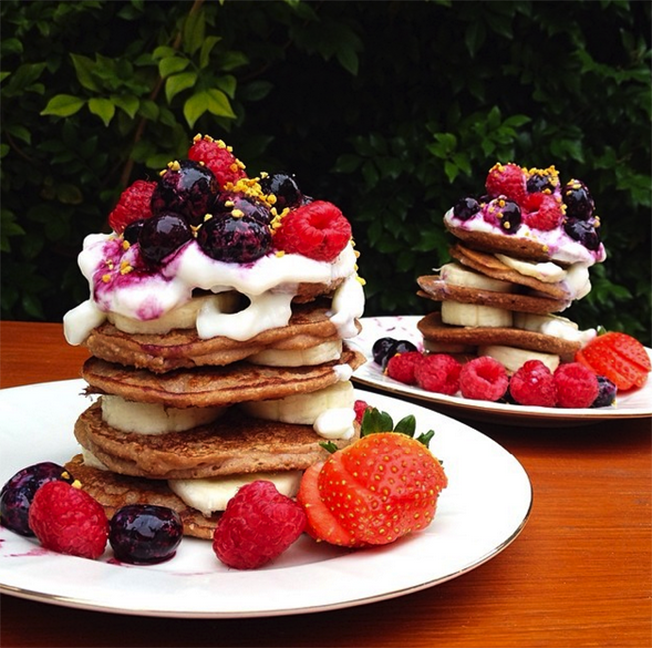 what are sundays without pancakes ? The Manila Social Club in New York's Brooklyn borough is home to the $100 donut, and the restaurant is also behind a mouth-watering Instagram account. The French-inspired Filipino cuisine puts a spin on breakfast with donuts made of sweet yams and mango soufflé pancakes. The eatery's Instagram feed functions as a tutorial on how to properly market your restaurant on social media. The food photos come with appetizing descriptions, leaving the follower thinking about eggs and French toast.